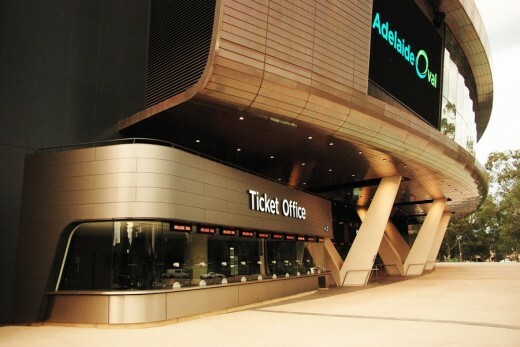 Visitors to the newly redeveloped Adelaide Oval – one of Australia’s most iconic sports venues – will now be greeted by a dramatic, cantilevered curved form over the main entrance, created from over 4,000 individual panels of Nordic Bronze from Aurubis. Designed by lead architects Cox Architecture in association with Walterbrooke and Hames Sharley, the redevelopment involves new south and east stands, related to the previously redeveloped western grandstand. It provides 50,000 spectator seats and ancillary facilities for cricket and Australian Rules football, as well as other sports and entertainment. The design is conceived as a series of pavilions in a parkland setting. The two new stands combine concrete structures and tiered-seating, curtain-wall glazing and diagrid PTFE roofs. A copper mesh veil provides shelter and solar shading to facades, and is pierced by a series of solid Nordic Bronze clad volumes, orientated to optimise specific local views. The distinctive form of the William Magarey Room is encased in a double-curved geometry façade of Nordic Bronze panels, inclined in a sectional plane, announcing the main entry point to the south stand below. Each segment exposed to different climatic conditions will generate subtle variations in weathered surface tones over time. The Nordic Bronze skin flows underneath to form a reflective soffit, then into the interior to define the solid mass while blurring inside and outside boundaries. Cladding was installed by Cladding & Roofing Contractors PTY. In addition to Nordic Bronze, other Aurubis copper alloys include Nordic Brass and the innovative Nordic Royal, an alloy with a long-lasting golden colour. Aurubis Architectural copper surfaces include Nordic Standard ‘mill finish’, as well as Nordic Brown pre-oxidised copper giving either light or dark brown oxidisation that otherwise takes time to develop in the environment. Adelaide Oval is widely regarded as the most picturesque Test cricket ground in the world, with St Peter’s Cathedral rising behind the elegant Edwardian scoreboard and Moreton Bay fig trees at the northern end, the Mount Lofty Ranges to the east, and nearby city skyline to the south.